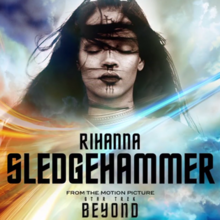 I just heard Rihanna’s “Sledgehammer” And it literally sounds like Sia. I’m too busy masturbating to go see if Sia wrote the song, but I bet she did. And then when Rihanna heard it, learned it & recorded her vocals to it, she imitated the original demo vocals that again, I’m sure Sia did. It’s like listening to Rihanna doing Sia. Now you Sia, now you don’t.